Capt. Steven Ford calls his appointment to lead the Bayview Police Station a homecoming. Not just because the Bayview was Ford’s first post after his field training in 1991, but because his parents grew up on its streets in the 1940s — his mother on Navy Road in Hunters Point, and his father on Connecticut Street in Potrero Hill. 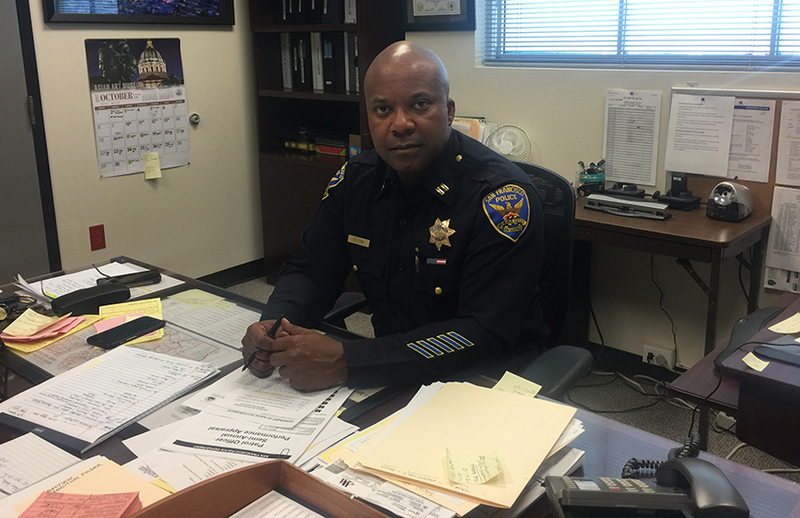 “I know this district like the palm of my hand; It’s my old stomping ground,” he said recently in his office at the Bayview police station, where his desk is covered with papers he needs to sign and overtime cards he needs to approve. His cell phone dings every few minutes. But Ford presides over what could feel like a scene of disorder with utter calm. He is precise with his words and movements. He has to be. On top of leading the Bayview station, he teaches night courses at City College and attends class every other weekend to work on his doctorate in educational leadership. For him, each minute must be productive. “I’m very regimented,” he said. Ford is solidly built, which he maintains by waking up at 4 a.m. almost every day to go to the gym. His diet is carefully considered, and has recently been pared down to plants, with the addition of egg whites and occasional fish. He used to be a bodybuilder and still attends shows and picks up tips from his friends who lift. The 26-year-veteran is still formulating his plans for the Bayview, but he’s already hit the pavement to speak to merchants, community groups and faith-based organizations. He plans to review statistical data to consider where to invest resources. It’s clear that Ford is not going to be rushed. He takes a methodical approach that reflects an academic bent — he picked up a master’s degree in emergency services and administration and is now earning his doctorate. Nevertheless, he understands that building trust in the community will come down to making himself visible and his office accessible. But the relationship between police and the community in Bayview is not so straightforward. The Bayview is home to much of the city’s dwindling black population, against whom the SFPD has a disproportionate record of using excessive and lethal use of force. Last year, the Department of Justice was invited to San Francisco after a string of officer-involved shootings — the last two of which were were of black people in the Bayview. Since his early days as a beat officer in Bayview, Ford’s extensive career has given him a thorough tour of the San Francisco Police Department. He’s patrolled from the north to south of the city, worked on criminal, background and burglary investigations, and staffed the department’s Homeland Security Unit. But he said that the six years he spent in Internal Affairs, investigating misconduct in the SFPD, were the most important in his career. Ford won’t go into the specifics, but said he saw the gamut of penalties imposed, from a verbal reprimand to termination. “The underbelly of discipline is to hold people accountable,” he said. And in his last position — before he was promoted to Captain on Oct. 21 — Ford was, in a way, helping impose department-wide discipline, overseeing the implementation of the 272 recommendations from the Department of Justice. “I think the Department of Justice report was a fair assessment,” Ford said, quickly amending his statement to emphasize that that is his personal opinion. Ford chooses his words so prudently that it is hard to recognize anything personal at all. “I know not everyone felt as positively about it,” he adds. “But in this day of 21st-century policing, it is most important for us to be transparent, and the Department of Justice has created a sense of transparency,” he said, giving a nod to former President Barak Obama’s Task Force on 21st Century Policing, which promoted community policing and de-escalation tactics over supplying local law enforcement agencies with military-grade weaponry. Ford said he will foster community policing in the Bayview. Right before Ford took over the district, his predecessor, Capt. Raj Vaswani, had pledged to double the foot-patrol presence in the Bayview by November. It’s unclear if that goal has been met, Ford said, but he’s committed to it. Just to let you know I am grateful for your consistent following of SFPD. The articles are well written and factual. Keep up the good work. Joanne Keaney.